Danielle Litt is a college student from the U.S. who volunteered with the Centro Educativo La Buena Tierra, (The Good Earth Education Center). CFCA partners with La Buena Tierra to provide services to sponsored children. Children sponsored through the CBT subproject are either attending or have attended the pre-school program Danielle describes below, and older children are served by the centerís staff in after-school programs, in addition to other benefits. My name is Danielle Litt. I am from New York City and am a junior at the University of North Carolina Chapel Hill (Go, Tar Heels!). I am majoring in Latin American Studies and minoring in Hebrew. This semester, I am studying abroad in Cuernavaca, Mexico, and I have had the amazing opportunity to intern at La Buena Tierra, the education center that serves the children you sponsor. I performed a variety of tasks including translation of the childrenís letters into English. I enjoyed reading these letters, as it gave me an opportunity to learn more about the lives of the children. I enjoyed reading about what they do for fun, hearing their stories and learning about the struggles they face and overcome. I also enjoyed reading about how important you, as sponsors, are to them, and seeing all the thank-you letters. The children are so appreciative of the letters and photos you send them! Let me tell you a bit about a typical day at the Buena Tierra. The children enter the school one by one, tell each teacher good morning and greet them with a kiss on the cheek. Then the children proceed to breakfast, but first say grace, which includes thanking God for you, their sponsor. The staff also teaches the children good table manners. During the day, the children learn about a variety of subjects, including the alphabet, counting, nutrition, families and animals. At the center, there is a lot of singing, playing, drawing, laughing and learning. At the end of the day, all the children gather together, sitting on blankets. They have story time and sing songs. There are so many amazing people who make it possible for the children to attend the center. The teachers work patiently with every student to ensure they are learning and being challenged. The students come to class with smiling faces and an eagerness and excitement to learn. They are what makes all of the work worthwhile. The childrenís families contribute any way they can and support their childrenís attendance at the center. And while you are not physically at the center, your presence is felt by your sponsored child and the whole organization that feels gratitude for your contribution. Each sponsored child is provided with the opportunity to have a preschool education and begin elementary school with the skills needed to succeed. Older sponsored children are alumni of the school and receive after-school tutoring to make sure that they are keeping up in their classes. Although I am excited to return back to my community in the United States, I will be sad to leave the Buena Tierra behind. 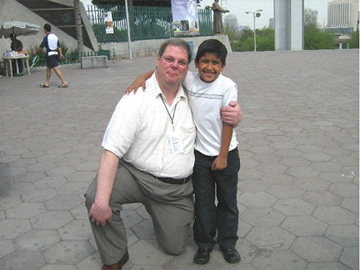 Although you donít know me, I have great appreciation for the gesture you have made by sponsoring a child through CFCA, as you reach across borders of class, nationality, ethnicity and age to show solidarity and provide opportunities for the children who are served through the Buena Tierra. You are doing something that truly matters! Our God, who is relational by nature, chose to become a member of the human family as an expression of intimate love. We, Godís children, are also relational and the yearning of our hearts for closeness to God and to one another is a reflection of our nature and Godís deepest desire. Because of this, relationships are the very essence of life. Godís two greatest commandments are not about what work we do, or what we eat, or even how we are to worship God. Our two greatest commandments are to love God and each other. We believe this is the greatest gift that CFCA has to offer to the world. The reason the founders chose the sponsorship model was because it is relational. One does not simply write a check and forget about it. Sponsors are called into personal relationships with someone they didnít even know existed before sponsorship. 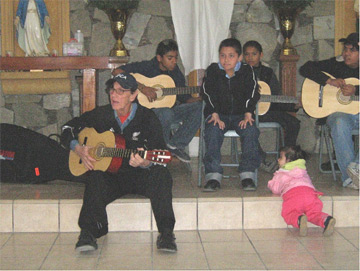 They are given the opportunity to love God by loving another of Godís children. Sponsor and sponsored friend carry one another in their hearts and allow the other to change them for the better. CFCAís structure in our projects follows this model as well and feeds the need for relationships among those we serve. For example, mothers in Merida, Mexico, tell us that the CFCA mothers groups are the most important part of the program to them. Most of their families moved from villages to the city, and that move isolated them from the social fabric that had sustained their ancestors for generations. The mothers groups are recreating that sense of community that is so essential to a full life. Lent gives us a chance to stop and examine our relationships. It is often easier to give up chocolate for Lent than to rebuild and heal relationships. 1. How would you define your relationship with God? Is God your teacher? Friend? Distant relative you only see on holidays? Guide? Do you like that relationship or do you want it to change? What needs to happen to bring about that change? 2. Is there a friendship that you have lost and mourn that loss? What might God be calling you to do about that? An October 2008 study by the United Nations University reported that “installing toilets and ensuring safe water supplies would do more to end crippling poverty and improve world health than any other measure.î CFCA projects in El Salvador, Kenya, Ecuador and Mexico provided photographs showing sanitation conditions in their communities. Donate to CFCA’s Healthy Communities Fund to improve basic health and hygiene services and facilities for families and communities. As we give thanks for the old year and look with anticipation to the new one, let us walk in solidarity with our sisters and brothers around the world throughout the day. We have listed below the time it will be here in the United States when the New Year arrives at each of our projects. We encourage you to say a quick prayer for each of the projects as your day progresses. Philippines 8:00 a.m. 9:00 a.m. 10:00 a.m. 11:00 a.m.
India and Sri Lanka 10:30 a.m. 11:30 a.m. 12:30 p.m. 1:30 p.m.
Madagascar, Kenya 1:00 p.m. 2:00 p.m. 3:00 p.m. 4:00 p.m.
Nigeria 3:00 p.m. 4:00 p.m. 5:00 p.m. 6:00 p.m.
Liberia 4:00 p.m. 5:00 p.m. 6:00 p.m. 7:00 p.m.
Brazil 6:00 p.m. 7:00 p.m. 8:00 p.m. 9:00 p.m.
Chile 7:00 p.m. 8:00 p.m. 9:00 p.m. 10:00 p.m.
Bolivia, Dominican Republic 8:00 p.m. 9:00 p.m. 10:00 p.m. 11:00 p.m.
Venezuela 8:30 p.m. 9:30 p.m. 10:30 p.m. 11:30 p.m.
Haiti, Jamaica, Peru 9:00 p.m. 10:00 p.m. 11:00 p.m. 12:00 a.m.
Mexico, Nicaragua 10:00 p.m. 11:00 p.m. 12:00 a.m.
Gracious God, I pray for my sisters and brothers in ______. May the New Year bring them hope, joy and peace. And from all of us at CFCA, we pray the New Year also brings you hope, joy and peace! Receive CFCA’s weekly Prayer Partners e-mail. Today is the feast of Our Lady of Guadalupe, celebrating Maryís apparition to an indigenous man, Juan Diego. This important Mexican holiday represents Godís deep and intimate love for the poor. Mary and Jesus walk with the poor through Juan Diego, calling him by name and recognizing his dignity and the dignity of the Mexican people, who had just been conquered by Spain. Matilde Mendoza, a CFCA staff member from the town of Villa Garcia, in the state of Nuevo Leon, summed up the importance of the Virgin of Guadalupe to CFCAís sponsored members. The morning of Dec. 9, 1531, Juan Diego was walking near the Hill of Tepeyac when he had a vision of the Virgin Mary. In his native language of Nahualt, she instructed that a church be built at the site. Juan Diego, an Aztec Indian, relayed the request to Mexicoís first bishop, Juan de Zumarraga. When the Spanish bishop demanded proof of this vision, Juan Diego returned to the hill Dec. 12. Mary once again appeared to him and told him to collect some roses from the top of the usually barren and desolate hill. He gathered the roses in his cloak and returned to the bishop. As the roses tumbled to the floor, an image of the Virgin of Guadalupe was emblazoned upon his cloak. Here was the proof Bishop Zumarraga needed, and he approved the construction of the church. Today, the Basilica of Our Lady of Guadalupe is located north of Mexico City, and 477 years after her appearance Maryís image is still visible on Juan Diegoís cloak, which hangs in the basilica. The feast of Our Lady of Guadalupe is celebrated from Dec. 3-12. 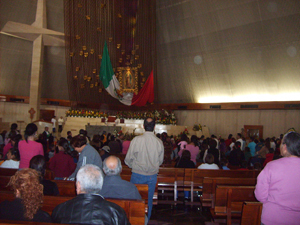 The forms of venerating and celebrating the Virgin of Guadalupe vary according to region, neighborhood, church, city and state. In Villa de Garcia, home to 270 CFCA sponsored members, Mass is celebrated every afternoon followed by pilgrimages and lectures about Mary or performances portraying the encounters between her and Juan Diego. The pilgrimages weave through Villa de Garcia so that the largest number of people can participate. The Matlachines, indigenous dancers in traditional clothing, lead the pilgrimage by dancing and beating the drum. The people follow and, from time to time, sing and pray. On Dec. 11, the pilgrimages end at midnight with mariachi performers serenading the Virgin, and on Dec. 12, after the Mass, people gather†at a big festival†for fellowship and to honor the Lady of Guadalupe. CFCA has always been guided by its humble spirituality and vision. We have always said, “Lord, give us a spirit of always beginning.” Always thinking, always creating, and always finding ways to reach out to those in need of help and to those who need to help. I was blessed to recently participate in a CFCA Latin American Encuentro (gathering) in Guatemala, with the Coordinators of CFCA projects in Latin America: Mexico, Guatemala, El Salvador, Honduras, Nicaragua, Costa Rica, Colombia, Ecuador, Venezuela, Bolivia, Dominican Republic, Brazil and Chile. Our hope was to unite creativity, spirit, faith and hard work, to look towards the future of our sponsored families and to offer our sponsors a transparent opportunity to help one child not to have more, but to be more. 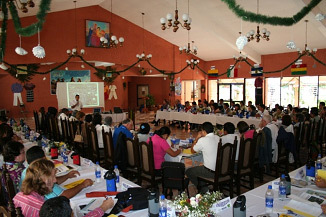 During three days, we learned about many different programs functioning in CFCA Projects all across Latin America. What an amazing experience to see the extraordinary amount of talent in our CFCA staffers, offering real options of hope for the sponsored and their families. The current economic situation of the world is making life harder—further limiting the poor as they try to reach a better future. Many of our families are suffering deep and brutal situations due to the lack of jobs, health and opportunities; they find it more difficult to survive every day. The reality is so difficult that many poor people are trying to find ways for their children to work to contribute to the family income. The grassroots movement of CFCA is based on offering our sponsored families options for them to reach their very own dreams, starting from what they know and building from there. CFCA creates livelihood programs… Projects in Honduras have sponsored families growing pigs, selling them and making extra income from it. Our Guatemalan families are being blessed by producing and selling products such as pants, backpacks, nutri-cereals, etc. Many others are growing chickens, goats and planting corn. In Costa Rica, families are producing cloth dolls, some mothers have beauty shops and others are marketing local homemade jelly. These families are not only growing economically, as they market their products, but they are also becoming experts in these fields, acquiring a higher self-confidence as they are capable to provide for their families. Just as Jesus sent the disciples to spread the good news of His kingdom, all of us, CFCA servers, were sent to promote the dignity of the poor and to offer hope by building, with the support of our sponsors and our sponsored families, options for needy people. To create an environment where they can be builders of their own future, asking them what they want to accomplish, learning from their human potential and developing programs from there. It is a pleasure to be in touch from northern Mexico. I am very grateful to be able to spend this week with our CFCA family here. This trip is focused on CFCA projects in northern Mexico, including the states of Nuevo León, Tamaulipas, Coahuila, Durango, Zacatecas, San Luis, Potosi, Jalisco and QuerÈtaro. Sponsors were invited to say something about their sponsored friends and to tell us about their involvement with CFCA. Father Tony Lee, pastor of St. Jude’s Parish in Peoria, Ill., shared that while he is here, Father Peter Herely is leading a CFCA weekend at St. Jude’s. Our prayers are with you, Father Peter. On Monday, Father Tony and I teamed up for a bilingual morning prayer, readings for Lent, hymns led by Bob and shared intentions. Tomorrow morning, Father Tony will celebrate Holy Mass for us in English. The Ortigosa Home and Day School—preschool through junior high—serves 88 sponsored boys and girls. The sisters had organized a general assembly of the students that included musical interaction with students by Bob. Boarders served as guides for sponsors on a tour of the facilities. Warmth, love and shared snacks topped off the visit. We remembered in a special way the meeting today of the OAS as it considers the crisis of Colombia, Ecuador and Venezuela. girl, Rosario. I am happy to report that this trip went very well for Jerry, for Rosario, for the Sisters in Nuevo Laredo and for staff member Miguel Angel Alba, who did all the driving. Our group visited 65 dynamic families of subproject PAN, many of them squatters living in the area of Cerro de la Campana. 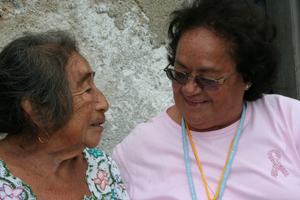 Mothers Licha, Marta and Petra are the community leaders. Staff member Matilde from the project office offers solidarity, visits and support. The tiny kids danced a cute number, and 7-year-old Magali proclaimed, “It’s really bonito (nice) to have a sponsor.” Maria spoke of her two children, a 9-year-old boy in fourth grade and a 14-year-old girl who is a special child. She emotionally expressed her gratitude for the sponsorship program. Other mothers, including Francisca, Claudia and Sylvia, also expressed a sincere and balanced gratitude. At Parras de la Fuente, 76 spontaneous sponsored children were waiting for us, together with veteran missionary educator, Sister Rosario. Her congregation has served in this home and school since 1912. Alexis, Estefania, Gloria and Jorge all did a nice job on their respective songs, singing a-Capella at that. The sixth graders upheld the poetic fame of their town with two synchronized declamations: La Muóeca and Parras Tierra de Poetas. I encouraged the kids to appreciate these precious years in such a pretty and good school. They were proud to say aloud the names of their sponsors. Bernardo Grousset School, which houses subproject BGS, has a warm and welcoming atmosphere. Parents are welcomed to participate in the classes. Creative thinking, spontaneity and self-confidence in expression are encouraged. A general assembly of students took us through the entrance of the flag, norteoo folk dances and vocals. Cristina and I are now on our way to Guatemala City to meet the mission awareness trip group arriving March 8. Thanks again for traveling with us.